PHOENIX, Ariz.—The Armenian Revolutionary Federation’s Phoenix Kevork Chavoush Gomideh hosted a celebration of the party’s 128th anniversary at the Armenian community center. The keynote speaker for the event was ARF Western U.S. Central Committee member Garo Madenlian who, in his remarks, highlighted the important role smaller communities play in bringing together Armenians who live away from the epicenters of the community, such as Los Angeles. 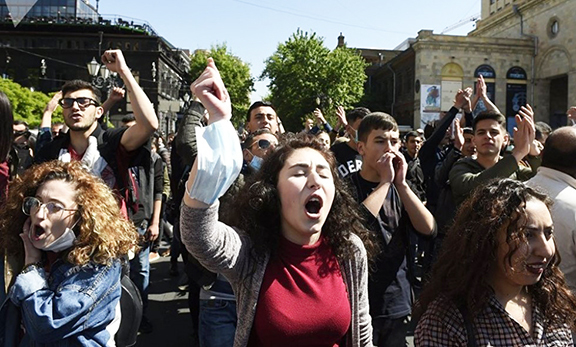 Madenlian also emphasized the need to involve youth in every-day community activities, especially in smaller communities where the young generation can bring added impetus to efforts to advance the Armenian Cause. The evening also included a cultural program that featured popular singer Raffi Badoyan performing patriotic songs. Community leaders and activists came together for a cake-cutting ceremony marking the ARF’s 128th anniversary. A day-long conference organized by the ARF Western U.S. Central Committee’s special commission on distant chapters brought together members of ARF chapters and affiliate organizations from Las Vegas, Phoenix and Houston. The evening’s celebration coincided with a day-long conference organized by the ARF Western U.S. Central Committee’s special commission on distant chapters bringing together members of ARF chapters and affiliate organizations from Las Vegas, Phoenix and Houston. Welcoming remarks at the conference were offered by the commission’s chairperson Hovig Bedevian. His presentation was followed by opening remarks by ARF Western U.S. Central Committee member Toros Kejejian, who stressed the important role distant chapters play in fulfilling the overall goals and objectives of the party. Updates and briefings on ANCA activities were presented by ARF Western U.S. Central Committee member Steve Dadaian and ANCA-WR Communications Coordinator Dickran Khodanian. Rafi Orphali presented an overview of activities of the Armenian Youth Federation, the AYF Junior organization, as well as AYF Camp activities, highlighting that this year marks the 25th anniversary of AYF’s signature Youth Corps program. The conference concluded with a presentation on organizational activities and expectations by John Kossakian.